GROWING UP IN THE SOUTH, surrounded by hardwood trees that obscured one’s vision, expansive vistas were hard to find. The old highways bore “See Rock City” signs, and the occasional billboard showed someone looking out from a precipice where you could supposedly “See Seven States!” Maybe that’s what I imagined a bluff to be, so it was enlightening to drive into Farmington and see nothing but bluffs. Real bluffs. Bluffs to the south and north, and Ship Rock looming in the west. 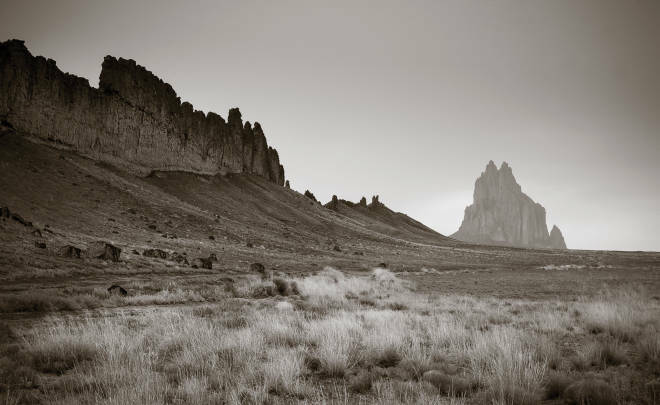 We checked into the Bluff Motel, and that evening, as the light played on those cliffs above the San Juan River, striking the geographical contours, folds, and layers of the rock, I became aware of things that didn’t exist in Tennessee or Louisiana, where I spent my youth. It was August 30, 1974. The air already had the clarity of autumn, and the sky a deep blue I had never experienced before. I somehow came to my own conclusion, albeit in a less scientific way. My husband I chose New Mexico as our destination for separate reasons. Mine had to do with years of studying Spanish and having a fascination with the cultural mix of Hispanic and Native populations in the state. As a graduate student at Louisiana State University, I had written to a New Mexico chamber of commerce and had received some travel brochures, which I have kept to this day. On the cover of the road map was a photograph taken from above Acoma Pueblo with Enchanted Mesa in the distance. I fell in love with that unique geography and sparse vegetation, as did my husband during a three-week On the Road–type adventure out West with college buddies. Also, realizing that his bachelor’s in English wasn’t the most useful degree, he assumed that he could find a construction job in Farmington’s mid-seventies’ boom period. Most locals and sightseers are familiar with the Bisti Highway (NM 371) as a means to get to the De-Na-Zin Wilderness, or the Bisti Badlands, a fascinating area full of hoodoos—another geographical term unfamiliar to southerners—about 45 miles south of Farmington. I became enchanted with it on the winding ride up to my job at the now defunct KIVA-TV station, set atop the bluffs on a little dirt road off to the left of the highway. During my frequent breaks, I would step outside and marvel at what I could see: the La Plata and San Juan Mountains in Colorado (usually snow-capped), Sleeping Ute Mountain in Utah, Ship Rock, the Lukachukai and Chuska Ranges in Arizona, and Angel Peak to the east. On my lunch hour, I would drive back down 371 toward Farmington and take the River Road east over to a family-run apple orchard and buy some of the best apples I’ve ever had in my life. On evenings and weekends, my husband I spent hours on those bluffs in his pickup truck, exploring the endless dirt roads and canyons, never tiring of that expansive view and the ever-changing colors of the rock—sometimes brown, yellow, lavender, or red, depending on the time of day. One March day, we bought a box kite and released it over one of those canyons. It took a long time before it was out of view completely. Unfortunately my husband’s strong Scotch-Irish roots and family ties pulled us back to Tennessee after three years in New Mexico, and I have mourned the move ever since. We traveled back to the West as often as possible over the years, both of us feeling the need to return to the desert in order to feel the sky open up to us again. When he was diagnosed with cancer a few years ago and given a short time to live, he asked me to spread his ashes somewhere “over on the bluffs.” I remembered Woodrow Call in Lonesome Dove, when a dying Gus McRae asks him to return his body to Texas and bury it beside a grove of live oaks on the Guadalupe River. Gus tells Woodrow that he is doing him a favor, as it gives him an excuse for another journey. An argument ensues about the need for him to be carried back to Texas after such a long journey to Montana, and Gus says, “But we had our happiness in Texas.” And ours was in New Mexico, so I took my mission seriously, secretly happy that he had given me a purpose for another Western adventure. My daughters and I spread his ashes there in May of this year. Our delightful and informative host, David Beers, at the Silver River Adobe Bed and Breakfast (a magical place overlooking the San Juan River, with a striking view of the bluffs) gave us permission to scatter some of them on the banks of the river among the Russian olives and cottonwoods. And once we had negotiated the myriad dirt roads that intersect at the top of NM 371, and I had pointed out all of the landmarks that could be seen in that 360-degree panorama, I lay them beside a poignantly lone piñon tree. This trip was about more than a ceremonial relinquishing of my husband of 40 years. It was also meant to show my daughters what New Mexico means to me, more than just the stories we have told them all their lives. And there was no lack of enthusiasm on their part. The Southwestern artifacts and ristras at the airport drew comments such as, “This all looks like your living room!” From Albuquerque to Chimayó, Taos, and Farmington by way of NM 84 through Abiquiú and back to Albuquerque on NM 550 (my favorite New Mexico highway), Acoma Pueblo, and green chile at every meal, they loved it all. And they could sense my exhilaration in spite of the sadness of the mission. When my oldest daughter asked me again how long we had lived there, and I told her three years, she said, “Only three years! It’s hard to imagine, as the arm’s breadth of it has reached so far in all our lives.” That it has, and I hope it brings me back there for good one day.